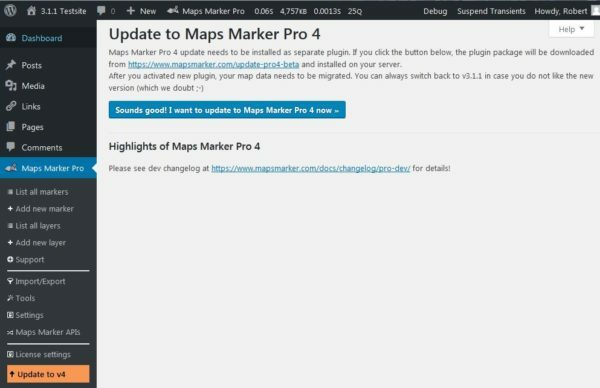 We are happy to announce that Maps Marker Pro v4.0-beta1 is finally available. Version 4.0 of Maps Marker Pro features a complete object-oriented rewrite of the codebase. While this process took quite a few months to complete, the long-term benefits are absolutely worth it. Not only does the new code dramatically decrease load times and enhance security, but it also makes it much easier for us to fix bugs or implement new features. changes to map concept: with v4.0 only maps and markers will be available anymore (the term layer maps is no longer used; marker maps cannot be created anymore – existing marker maps will be migrated). Leaflet.GestureHandling support has been added (Brings the basic functionality of Maps Gesture Handling into Leaflet and prevents users from getting trapped on the map when scrolling a long page). The design and interface on backend is also not final yet – the current focus is to test the new features and optimized code. Please also be aware that future beta-releases might require to re-run the migration tool for migrating maps from v3.1.1-beta1, which will reset any changes made since v4.0-beta1 has been installed! Please also do not delete v3.1.1 at least unless v4.0 final is available, as there still might be changes to the database structure and the need to re-run the migration tool to update your data! Let us you think about this new release & send your feedback by using our helpdesk (prefered) or directly via email to feedback@mapsmarker.com. Warning: it is not recommended to install 4.0-beta1 on production sites! In addition we recommend to backup your site (especially the database) regularly so in case of an issue with this beta release you can always perform a full rollback if needed! As next step click on the link “Update now” to update to v3.1.1-beta1. That´s it – now you can start using Maps Marker Pro v4.0-beta1. Please do not delete v3.1.1 at least unless v4.0 final is available, as there still might be changes to the database structure and the need to re-run the migration tool to update your data! For directly downloading and installing the v4.0-beta1 package as zip file, please click here. Please make sure to also set beta-testing in Settings / Misc to enabled to get notified about future beta releases! If you want to use v3.1.1-beta1 again, please first deactivate Maps Marker Pro v4.0-beta1 and then activate Maps Marker Pro v3.1.1-beta1 again. Please be aware that any maps which have been created with Maps Marker Prov 4.0-beta1 will not be visible with Maps Marker Pro v3.1.1-beta1, as a complete new database schema is used! Definitely exciting to hear about the faster loading time with Maps Marker Pro v4.0-beta1! I look to streamline and save time as much as possible when it comes projects, and you have finally delivered with this update! I’m looking forward to adding this time cut to my project management online set up, so now I can dedicate all of that extra time elsewhere! Thank you for providing a quick link to the download! Thanks for your feedback Dennis, much appreciated!